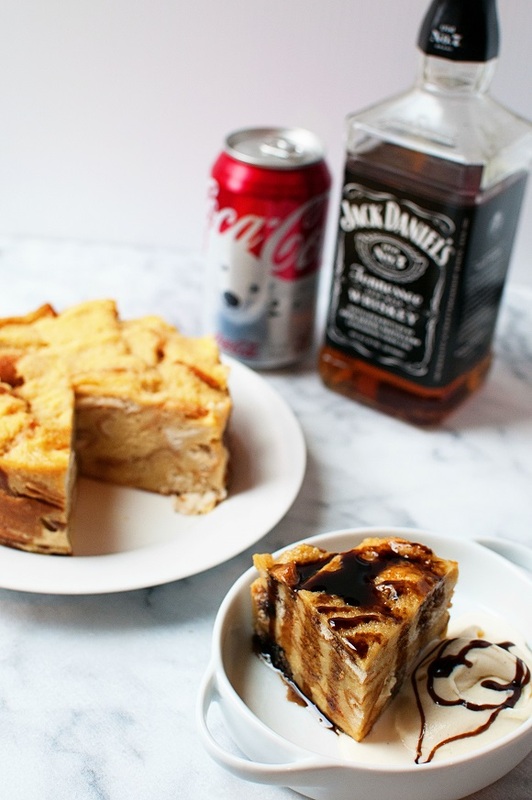 Jack and Coke Bread Pudding: Jack and Coke drinker? 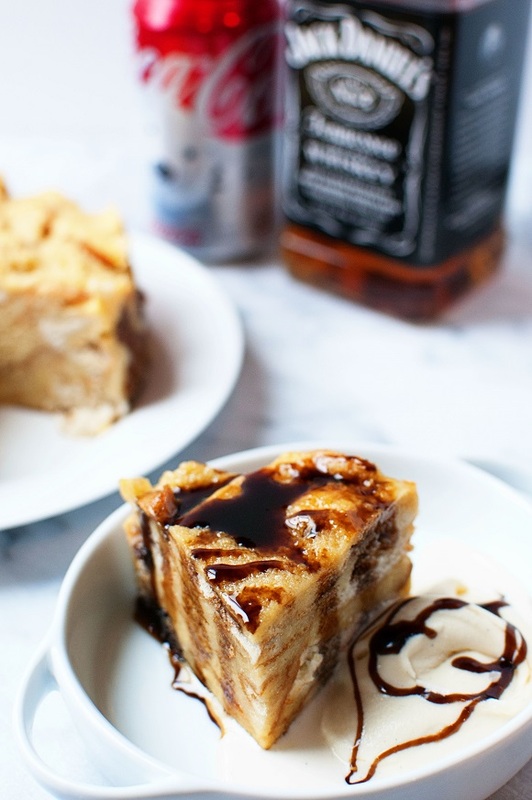 Then you will love this take on bread pudding with all the flavors of Jack and Coke in dessert form. Someone emailed me a few weeks back about my time as a WW leader and did I think someone could do WW without doing weigh ins? I think absolutely you could. You might get pressure if you go to an actually meeting to weigh in but the right leader won’t make you do it. But if you did online no one would be the wiser. Now you would need to put in some weight as it needs to calculate how many points you get but I would just let your body be your guide…you know when your pants are tight and when they are loose. I still think Weight Watchers is the most sensible way for me personally to lose weight since I still get to eat things I enjoy. I ate candy every day when I lost weight years ago and drank beer several times a week. I also believe in Live More Weigh Less which will be starting up again in the Spring and I intend on going through that again. So what can you do to start feeling good about yourself now? 1. This one people are not going to want to do but studies have actually been done on this…walk around naked. The more naked you are the more comfortable being naked you become. I mean when you are in your bedroom getting ready walk around a bit naked, don’t throw on a t-shirt or a robe the second you jump out of the shower. Look at yourself naked in a mirror. Again I know you are thinking no way. The more you do it the easier it gets. Tell yourself one nice thing about yourself when you are looking at yourself in the mirror, even if you don’t believe it yet, saying it out loud will help you realize it is true. 2. Buy yourself a decent bra and pair of undies. Now even if you are sitting there saying I have no one to show them off to…you do, yourself! Go and have yourself measured for the right bra size. Pick out a pretty one. Buy some matching underwear…or don’t, be a rebel and buy some that doesn’t match at all. 3. Find an activity you like! Notice I didn’t say exercise. You will never stick with something if you don’t enjoy it. I have friends who tell me they love running yet go stretches where they don’t run for months. I tell them are you sure you love running and they say oh yes, it burns so many calories. So I say you don’t love running you love what running does calorie wise…BUT you get sick of it because you don’t actually love it. If I could afford to do it every day I would. I get upset when I have to miss a game. I’ve been playing for 15 years now and have never once wanted a break from it. I like the elliptical as well but I have to be in the mood. Like Zumba and all fast paced dance based aerobic classes. Like yoga (if taught by the right person). They all may burn a bunch of calories but if I only do it for a few weeks what’s the point? 4. Understand that you are not alone. I read it in one sitting, and then re-read it a few days later. She holds nothing back. She talks about the good, the bad, and the ugly (and there is a lot of ugly in weight loss journeys) in very real and raw moments. If you have ever struggled with your weight I highly recommend the book. HIGHLY recommend. When you learn to love yourself you will get to a point where you can have dessert. Not an entire pan but a piece. People love to comment to MDP and myself how are we not 500 pounds. Again we are not petite flowers by any means, but we are also not 500 pounds (not even combined 😀 ). But we eat one piece and then we move on. If we super-duper loved it then we eat two pieces but not in the same sitting. Bread pudding is one of my weaknesses. The old me would have eaten the whole thing but since WW and LMWL I recognize that I don’t need the whole pan of bread pudding. I thought it was ridiculously amazingly good. So the next day I had another slice. I had only made a small amount as it was since this was for Date Night In. I will admit I didn’t expect it to turn out so good. Especially since we used leftover hamburger buns as the bread. But it worked…it really, really worked. If you don’t want to go to the trouble of making the whiskey ice cream (which you should!) then I suggest making some whipped cream and throwing a few TBSP of Jack Daniels in there. Don’t however skip making the cola reduction, it’s easy but a little time consuming is all. Spray a 4 -1/2 diameter Springform pan with baking spray. Wrap the pan in foil so that when placed in a water bath water will not get in. Add the eggs, yolks, vanilla extract, Coke reduction, and sugar in a medium bowl and whisk until fully combined. Tear half of the hamburger buns into pieces and place into the Springform pan. Pour half of the custard mixture over the bread pieces. Push down on the pieces to get the custard to soak in. Add the remaining hamburger bun pieces and pour the remaining custard over them and again push down for the bread pieces to soak the custard in. Place the pan into a water bath. Remove the foil after 30 minutes and bake another 15-20 uncovered. Remove from oven and let cool to remove temperature. Remove bread pudding from Springform pan. To serve, cut into wedges, scoop Jack Daniel’s Whiskey Ice Cream on top and drizzle Coke reduction on both. I just recently got diagnosed with IBS, and have been on a low FODMAP diet. Got any good soy, honey, gluten, and high fructose corn syrup free recipes? 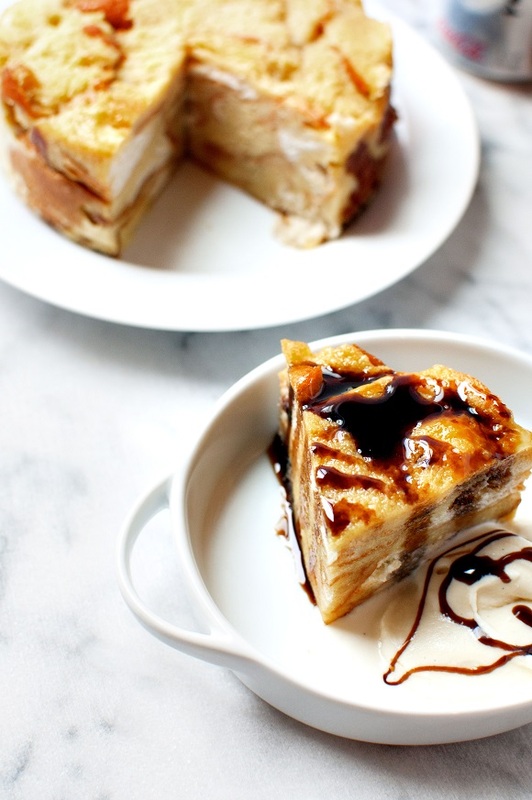 =) My mom LOVES bread pudding, I will make this for her birthday this year! Thanks! I loved Andie’s memoir. I cried through alot of it and just wanted to hug her after I finished it. Awesome. 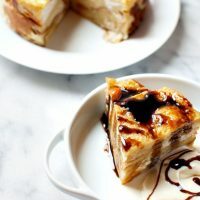 Bread pudding is the only thing I miss vegan! When people say don’t you miss… (Usually cheese) I tell nope just bread pudding! So nope not making this for my husband because its not fair he gets it and I don’t! I’ve been reading for at least 8 years now and rarely comment but just had to say… While I love to drool,over your recipes (and know that anything I make will be delicious) I think that what keeps me reading is your commentary and I just love your take on body image. So thank you!!! This turned out absolutely amazing, ive made the same bread pudding recipe for several years after discovering it only 4 years ago (no close family or relatives ever made it, hadn’t even heard of it till i was damn near 30). my girl went nuts for it as well, never tried a cola reduction before either so it was fun on top of being tasty. thanks for the post! this is a response to Joy – if your vegan, why are you looking up recipes that have no real vegan alternatives and feel the need to tell everyone your lifestyle choice even though there is not even a smidgen of relation to this post? How do you know if someones vegan? – don’t worry, they will tell you. Trey- so glad you enjoyed it. I was really delighted with how well it turned out when I made it. @Trey- I believe Joy reads my blog because she just likes my blog. I think she was more lamenting in the fact that she misses bread pudding and if she made it for her husband she would be sad. So I get what she was saying.